Archbishop Emeritus Desmond Mpilo Tutu, popularly known simply as Bishop Desmond Tutu, is a retired clergyman of the Anglican Church and civil rights activist active in South Africa. Tutu is one of the AmaXhosa, the same tribe as Nelson Mandela, whom he met for the first time while Mandela was still a lawyer. Tutu was driven to enter the clergy thanks to pro-Apartheid education reforms making him give up his teaching career. During his priesthood studies, he chafed under the increasing grip the Apartheid system had over all aspects of South African society, and was appalled at the level of tension between various ethnic and religious groups. During this time, Tutu was highly supportive of the various anti-Apartheid movements brewing in South Africa, and defended them from the pulpit. During the 1970s, Tutu discovered Liberation Theology, a theological movement originating in the Americas that sought to re-contextualize Christian theology with regard to the struggles of the poor and Black oppression in the United States. Tutu embraced this approach whole-heartedly. 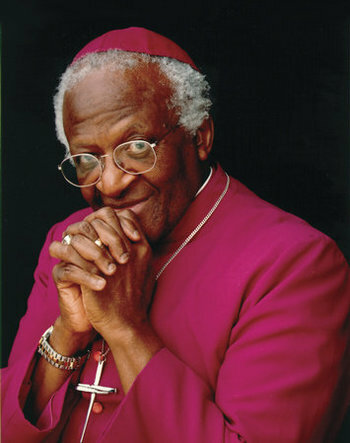 When appointed Bishop of Lesotho, Bishop Tutu used his newfound position to speak out against the injustices of South African society, staunchly supporting the Black Consciousness Movement led by Steve Biko, working with Winnie Mandela to advocate for her husband's release, and attempting to influence South African leaders to stop supporting anti-native legislation. He encouraged inter-racial harmony, insisting that his enemy was not the Afrikaners, but rather apartheid itself. These efforts got him into trouble with the government, but for the most part, they were unwilling to harass a clergyman more than necessary. He was jailed and forbidden to leave the country a couple of times, but it never stuck for long. He also became noted for his doctrinal liberalism, advocating for gender-inclusive language in the liturgy and the ordination of women, as well as inter-religious dialogue between other Christian denominations and other faiths. For his efforts, Bishop Tutu was awarded the Nobel Peace Prize in 1984. With the release of Nelson Mandela and his subsequent rise to the Presidency of South Africa, Tutu found himself firmly on the right side of history. His vocal support of the anti-Apartheid cause made him a global icon for human rights, and resulted in his meteoric rise in the Anglican Church, finally becoming the Archbishop of Cape Town. He eventually retired in 1996, but continued to play a supporting role in the dismantling of the old government. Nowadays, Bishop Tutu is most well-known for his advocacy for gay rights, his criticisms of American foreign policy, particularly during the administration of George W. Bush, support for boycotts and divestments against Israel, and agitation against capital punishment. Parallels have been drawn between him and American activist Martin Luther King Jr., regarding their similar Christian ethos, rhetoric of civil disobedience, and commitment to economic justice.